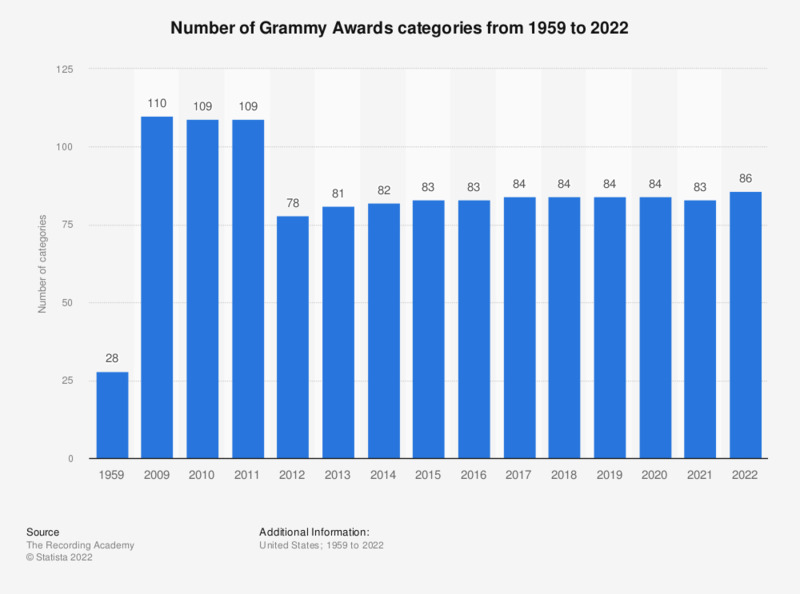 This statistic displays the number of Grammy Awards categories from 1959 to 2019. When the Grammy Awards were introduced in 1959, 28 different categories were available to win an award in. In 2009, the number reached its highest level with 110 categories. In 2019, awards were presented in 84 categories. The first edition of the Grammy Awards (originally called the Gramophone Award) was held on May 4, 1959 simultaneously on both American coasts: one ceremony took place in the Grand Ballroom of the Beverly Hilton, in Los Angeles, while another function was held in New York City. On January 28, 2018 the award show held its 60th edition. The Grammys are awarded by members of the United States National Academy of Recording Arts and Sciences (NARAS) in recognition of excellence in the recording arts and sciences. Since the year 2000, the Latin Grammy Awards is a separate ceremony, which honors excellence in musical works recorded in either Spanish or Portuguese, notwithstanding their country of origin. The number of categories has fluctuated since the first edition of the Grammys, reflecting changes in the world and specifically in the music industry, in terms of technologies and trends. In the first edition, only 28 Grammy categories were presented, such as Best vocal performance, Best jazz performance, Best comedy performance and Best recording for children, while the last edition featured 84 categories, including Americana album, Song of the year, Urban contemporary album, Rap/Sung collaboration or even Surround sound album. The highest number of Grammy categories was featured in the 2009 edition, when artists and technicians were nominated in a record of 110 different categories. Figures for years other than 2019 come from earlier publications.